To have an extended shelf life, most juices on the market are pasteurized, which uses the application of heat to destroy pathogens in foods. The trouble is, the process also kills the enzymes and nutrients originally found in the orange. These lost items are what give the juice 'life' and a lot of it's taste. You'll notice that each brand of juice has its own particular flavour that is consistent year round. That's because each company creates their own 'flavour pack' consisting of orange essence, fragrance and sometimes unnatural ingredients that are added back to the bland juice after it's been heated and cooled. Did you know some people can eat oranges but can't drink orange juice? Yale University Press author Alissa Hamilton shares more in a news interview. Enzymes, which are the key to all life function, remain alive. Vitamins that help support the body's natural healing and repair processes are unaltered. 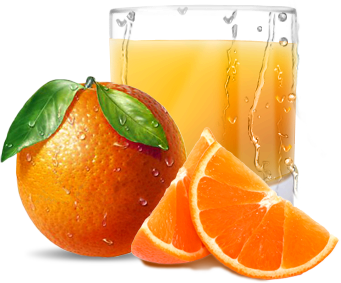 Only the natural occurring sugars from the orange provide you with clean energy.